Fuji's FinePix HS20 EXR is a powerful and versatile digicam that is loaded with easy-to-use and useful features. It has good performance and image quality, although it does struggle a bit with image noise at higher ISO settings. Read more in our Full Conclusion. 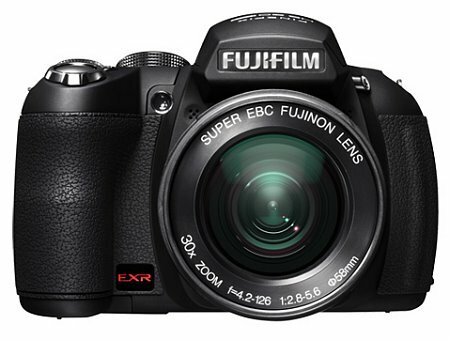 Fujifilm's award winning FinePix HS20EXR is an advanced, high quality SLR-like camera. It has been equipped with a new 16-megapixel EXR-CMOS sensor, a powerful 30x manual optical zoom (24mm-720mm equivalent), and a tilting 3.0 high contrast LCD. The electronic viewfinder features a "heads up" sensor that will switch automatically from the LCD to the EVF. The HS20EXR can deliver high speed continuous shooting at 8fps at full resolution, and features the option to capture full panoramic photos (with Motion Panorama 360). With improved intelligent processors and EXR technology, getting the best looking image is easily achieved. Using your choice of 27 scene modes or the EXR Auto mode, the HS20EXR will automatically choose what settings are best for the current subject. You can also choose form a host of manual controls to add your own creative touches. The HS20EXR is capable of shooting movies at a true 1080p HD quality. These are captured with H.264 high profile compression, for smaller file sizes without sacrificing quality. High speed movies can also be captured thanks to the new High Speed Movie Options, that can capture at an incredible 320fps. The FujiFilm FinePix HS20EXR is available now with a MSRP or $499.95 US. See our buy box below for the most current online pricing at various well known retailers.